One of my personal favourites, Fallujah, are doing something in the genre that is truly unique. Harvested from their The Flesh Prevails release, they were quickly sought after by Nuclear Blast leading to them to release their record Dreamless. 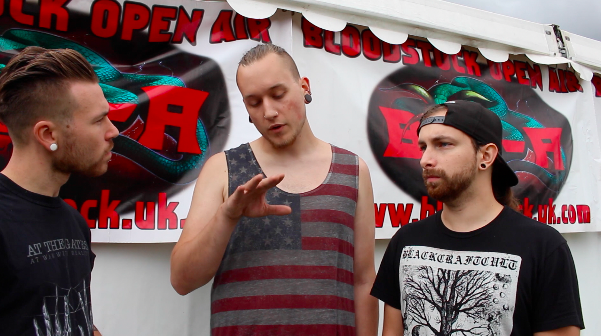 Following their first ever performance at Bloodstock, I was able to catch up with guitar duo Brian James and Scott Carstairs. Making waves across the scene, Fallujah have tapped into a potential that others would have never been able to deliver. Currently on their tour cycle to promote 2016’s Dreamless the band are entirely unstoppable. Following the departure of long time vocalist and total dude, Alex Hoffman, the band aren’t scared to be going into the void once more. Coming to somewhat of a creative cross roads, the world is their musical oyster now. Not that it wasn’t before mind, with the inclusion of clean vocals, both male and female along with electronic elements, there is seemingly not a lot that is out of Fallujah’s scope which is precisely what makes them just such a genius band. Bringing elements that would be disparate in any normal band, Fallujah create a rolling musical overture, acting almost as a soundtrack in its own right its the perfect escapism. Fallujah are currently on tour in the US and the gorgeous Dreamless is out now via Nuclear Blast.